Excellent smaller shrub with distinctive very small silver foliage and in June a plethora of single white flowers with the intense, penetrating fragrance of grape soda. To 5′ x 3′ forming an upright rounded deciduous shrub. Full sun and regular water to establish the first year then none in subsequent years. This may or may not be a hybrid- it really looks like the straight species. P. microphyllus which is native to the American Southwest. Tough and hardy and very drought tolerant shrub that is well scaled for smaller gardens. Fall color is bright yellow. Blooms appear on wood from the previous season. Prune directly after flowering is over- if needed. Selected by our friend garden designer Charles Price, he gave this to us and we thought it was distinct enough to deserve his name. 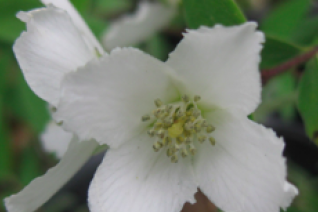 No offense to natives but I’ve always found our native mock orange to be kind of a dull one note shrub. Sure, its showy in bloom and certain specimens can be sweetly fragrant but once its done blooming…yawn. What do you do with it? 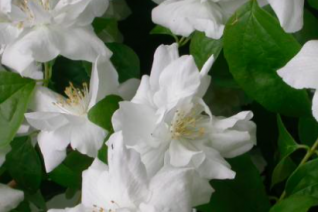 Instead plant this highly improved selection with enormous semi-double white lightly fragrant flowers. Each blossom is fully 2″ across and they come in such abundance in June that whole 9′ x 8′ frame. Full sun to part shade in average, well drained soil. Drought adapted. Great scaffold for summer Clematis. Fall color is soft yellow and brief. Oregon native plant.